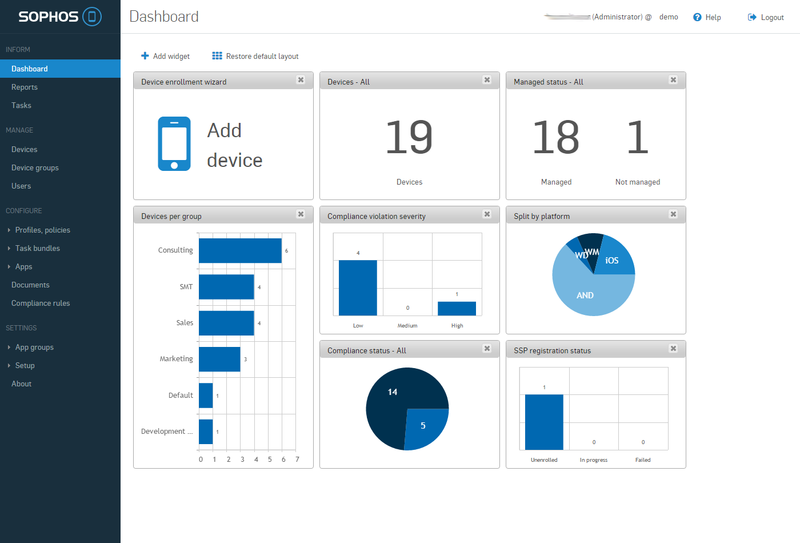 Sophos Mobile Control is the Enterprise Mobility Management (EMM) solution for businesses that find managing and securing mobile devices a challenge. Offering best-in-class data protection, straightforward management and comprehensive security, Sophos Mobile Control empowers productivity by allowing use of mobile devices for work while keeping business data safe. Powerful containers for email, calendars, contacts and documents ensure sensitive company data stays separated from personal data on the device, protecting business data while keeping personal data private. Spend less time and effort enabling use of mobile devices in the business and limit the associated risks. Sophos Mobile Control is easy to install, configure, manage, and maintain. This simplicity is true throughout the life cycle of your mobile devices, from enrolment to decommissioning. Powerful containers for email, calendars, contacts and documents ensure sensitive company data stays safe and separated from personal data on the device. Affordable and flexible license pricing based on number of users instead of number of mobile devices. Spend less time and effort enabling the use of mobile devices in the company. Increase productivity by allowing users to access company data from personal or corporate devices whilst eliminating the associated risks. Extensive support for supervised iOS devices, including Apple DEP, makes controlled roll-out faster than ever. Ensure sensitive company data stays safe and separated from personal data on the device. Access encrypted files and content seamlessly both from local storage or the cloud. Save time by configuring email and data access consistently regardless of device model or OS flavor. Ensure devices and company data safe from threats and malware. Easily restrict access to business resources or initiate remediating actions across the different layers of security in case of compliance violations. Easy to configure, manage, and maintain mobile devices throughout the different stages of their lifecycle, from enrolment to decommissioning. Minimize cost of ownership by keeping track of mobile users with full details of all hardware. Reduce IT time requirements by enrolling users and devices automatically, manually or through the self-service portal. Turn a lost device from a potential disaster into a trivial incident with the ability to reset, lock, wipe and locate a device, both by the admin and by the users themselves. As every one is using mobile media for solving and enjoying the daily routine netters, but there is always need to control this device and keep all records. The shared stuff regarding control of this device. The mobiespion.com is a best source which plays a big role in providing apps to control mobile device. The shared stuff regarding mobile control is informative. Yea in the modern period everybody want solution in short time and want good security. I'm Nancy CEO of Xaavo is using Sophos Mobile Control for that purpose.Really excellent solutions for smartphones. I've been thinking of adding Sophos Mobile Control to my list of app development frameworks, but would like to find more up-to-date information about this software. I liked the format of this article since all relevant key data was visible and easy to find, whereas on the official webpage there are only marketing copy.